To end the week, we put the latest 3D model added by Christophe Rohou, that of a wheat ear. “Wheat” is a generic term for several grains belonging to the genus Triticum. These are annuals of the family Grasses or Poaceae, grown in many countries. The word “wheat” also refers to the “grain” (caryopsis) produced by these plants. 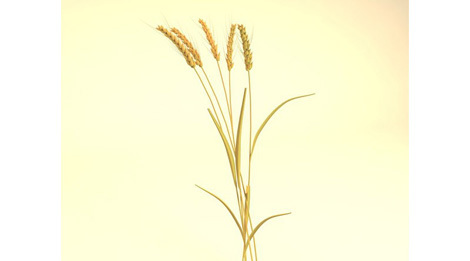 Wheat is one of three big grains with corn and rice. It is, with about 700 million tons annual, the third by the importance of the world harvest and, with rice, the most consumed by the man. Wheat is, in Western civilization and the Middle East, a central component of human nutrition. Two species of wheat were domesticated in the Near East from two wild wheats. Its consumption goes back to the highest antiquity. The first cultures appear in the 8th millennium BC BC, in Mesopotamia and in the valleys of the Tigris and Euphrates (now Iraq), in the region of the Fertile Crescent. Available for sale in 3D format: C4d.